This homemade ham and bean soup is downright delicious. 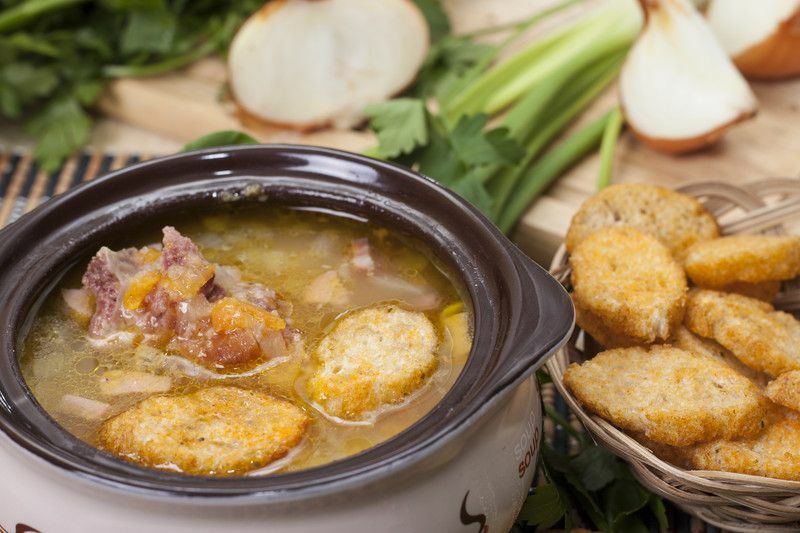 Made from scratch, a savory rich soup with chunks of ham. Perfect with my homemade crusty bread and a fresh salad. More homemade soup recipes at the end of the page. Soak navy beans overnight in water. If you don't have time to do this, it will take longer to cook the soup. Put a ham bone (with quite a bit of ham still on it), into a large stock pot with the rest of the ingredients and bring to a boil. After cooking for a good hour, remove the ham bone and cut off the remaining meat left on it; add to the soup. Cook the rest of the soup until navy beans are tender. Add more chicken broth as the soup cooks down, but not so much because it will change the flavor. If you do not have a ham bone, ham from a picnic ham will do. Season with salt and pepper when soup is done. Serve with a salad and garlic cheese bread (above). Meanwhile, in a small saucepan, melt butter over medium heat. Whisk in the flour and cook for one minute. Slowly whisk in the milk and cook until thickened; approximately five minutes. Add the the potato mixture and ham; cooking until heated through.